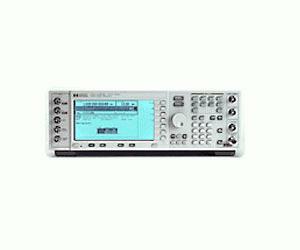 The Agilent E4430A digital RF signal generator provides a wide range of digital modulation capabilities in addition to a comprehensive feature set and excellent analog performance -- all at an affordable price. The first in a new generation of signal generators, it provides excellent modulation accuracy and stability, as well as unprecedented level accuracy. It is ideally suited to meet the demanding requirements of today'''''''s digital receiver test, component test and local oscillator applications. The innovative design of the Agilent E4430A provides a flexible architecture that can be tailored to meet the changing demands of evolving markets. Lower initial cost, high reliability and a two-year calibration cycle, all minimize the cost of ownership. The Agilent E4430A digital generator is designed for long-term dependability, which maximizes production throughput and uptime.